July 23, 2010, Washington, DC /Photography News/ Some of the most compelling photographs taken by renowned 20th-century American poet Allen Ginsberg (1926–1997) of himself and his fellow Beat poets and writers—including William S. Burroughs, Neal Cassady, Gregory Corso, and Jack Kerouac―are the subject of the first scholarly exhibition and catalogue of these works. Beat Memories: The Photographs of Allen Ginsberg will explore all facets of his photographs through 80 black-and-white portraits, on view at the National Gallery of Art, Washington, from May 2 through September 16, 2010. The works are selected largely from a recent gift to the Gallery by Gary S. Davis as well as from private lenders. Davis acquired a master set of Ginsberg's photographs from the poet's estate, including one print of every photograph in Ginsberg's possession at the time of his death. If more than one print existed, Ginsberg's estate selected the one with the most compelling inscription. In 2008 and 2009 Davis donated more than 75 of these photographs to the National Gallery. "We owe an enormous debt of gratitude to Gary Davis for his dedication to Ginsberg's work and for his donations to the National Gallery," said Earl A. Powell III, director, National Gallery of Art. "Joining other large and important holdings of photographs by such 20th-century artists as Harry Callahan, Walker Evans, Robert Frank, Lee Friedlander, André Kertész, Irving Penn, Alfred Stieglitz, and Paul Strand, this Ginsberg collection will allow future generations to study the evolution of the visual art of this important poet in all its rich complexity and to assess his contributions to 20th-century American photography." Additional support is provided by The Robert Mapplethorpe Foundation, Inc. The same ideas that informed Ginsberg's poetry—an intense observation of the world, a deep appreciation for the beauty of the vernacular, a faith in intuitive expression—also permeate his photographs. When Ginsberg first began to take photographs in the 1950s, he—like countless other amateurs—had his film developed and printed at a local drugstore. The exhibition begins with a small selection of these "drugstore" prints. The exhibition showcases examples of his now celebrated portraits of Beat writers such as Burroughs, Kerouac, and Ginsberg himself, starting just before they achieved fame with their publication, respectively, of Naked Lunch (1959), On the Road (1957), and Howl (1956), and continuing through the 1960s. In the photograph Bob Donlon (Rob Donnelly, Kerouac's ‘Desolation Angels), Neal Cassady, myself in black corduroy jacket... (1956), Ginsberg captures the tender, playful quality of his close-knit group of friends. Photographs such as The first shopping cart street prophet I'd directly noticed... (1953) and Ginsberg's apartment at 1010 Montgomery Street, San Francisco (1953), reveal his self-taught talents and careful attention to the world around him. The second section of the exhibition presents Ginsberg's later photographs, taken from the early 1980s until his death. These images were immediately embraced by the art world in the 1980s, and works such as Publisher-hero Barney Rosset whose Grove Press legal battles liberated U.S. literature & film…(1991) and Lita Hornick in her dining room...(1995) were exhibited in galleries and museums around the world. Prestigious institutions acquired Ginsberg's photographs for their permanent collections, and two books were published on his photographic accomplishments. Ginsberg was not simply a happy bystander, witnessing these events from afar; he was one of the most active promoters of his photography. With their handwritten captions by Ginsberg himself, often reflecting on the passage of time, his photographs are both records and recollections of an era. 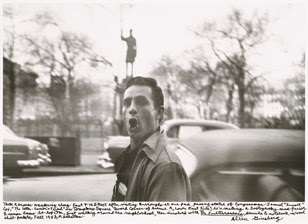 Together with On the Road (1957), written by Kerouac, Howl was immediately hailed as a captivating, if challenging expression of both a new voice and a new vision for American literature. Celebrating personal freedom, sexual openness, and spontaneity, Ginsberg and Kerouac came to be seen as the embodiment of a younger generation—the Beats—who were unconcerned with middle-class American values and aspirations and decried its materialism and conformity. Ginsberg abandoned photography in 1963. Unlike many other members of the Beat Generation whose careers were cut short, Ginsberg wrote and published deeply moving and influential poetry for the rest of his life, including Kaddish (1961), his soulful lament for his mother, and The Fall of America: Poems of These States, 1965 –1971 (1972), which was awarded a National Book Award in 1974. Using his fame to advance social causes, he also continued to capture public attention as an outspoken opponent to the Vietnam War and American militarism and as a champion of free speech, gay rights, and oppressed people around the world. In the midst of this popular acclaim, Ginsberg's photographs have not received much critical attention, especially in the years since his death in 1997. Although Ginsberg's photographs form one of the most revealing records of the Beat and counterculture generation from the 1950s to the 1990s, tracing their journey from youthful characters to aging, often spent figures, his pictures are far more than historical documents. Drawing on the most common form of photography—the snapshot—he created spontaneous, uninhibited pictures of ordinary events to celebrate and preserve what he called "the sacredness of the moment." Sarah Greenough, senior curator, department of photographs, National Gallery of Art, is the curator of the exhibition. Published by the National Gallery of Art and DelMonico Books, an imprint of Prestel Publishing, a fully illustrated catalogue includes an essay by Greenough, exploring the connection between Ginsberg's poetry and photography, and a 1991 interview between Ginsberg and Thomas Gladysz. The 137-page catalogue will include 92 illustrations and will be available for purchase in the Gallery Shops in hardcover and softcover. To order, please visit our Web site at http://shop.nga.gov/; call (800) 697-9350 or (202) 842-6002; fax (202) 789-3047; or e-mail mailorder@nga.gov. The National Gallery of Art and its Sculpture Garden are at all times free to the public. They are located on the National Mall between 3rd and 9th Streets at Constitution Avenue NW, and are open Monday through Saturday from 10:00 a.m. to 5:00 p.m. and Sunday from 11:00 a.m. to 6:00 p.m. The Gallery is closed on December 25 and January 1. For information call (202) 737-4215 or the Telecommunications Device for the Deaf (TDD) at (202) 842-6176, or visit the Gallery’s Web site at www.nga.gov. Follow the Gallery on Facebook at www.facebook.com/NationalGalleryofArt and on Twitter at http://.twitter.com/ngadc. Cool, Ginsburg was a great poet. I'm sure his photos perfectly convey his ideas. Is this exhibition going to travel? to NYC?